"Where the Moyola's just a stream...."
The Moyola River is a 27 mile waterway which cuts its course through the heart of mid-Ulster. 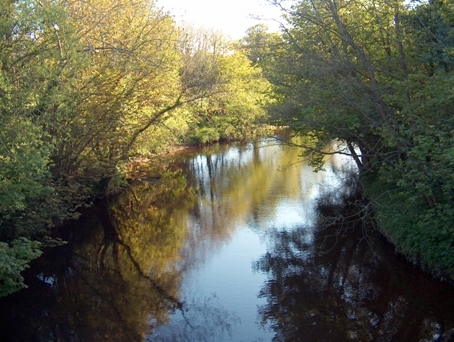 The river is regarded as one of Northern Ireland's premier salmon and dollaghan [Lough Neagh trout] rivers, and also boasts healthy stocks of native brown trout. Rising high in the Sperrin Mountains above Draperstown, the Moyola makes its way past the towns of Tobermore, through Castledawson before entering Lough Neagh near Toomebridge. The river is defined by contrasting features. In the upper reaches, the character of the river is one of streams and fast flowing water with short deep pools. The river also swells in size, as the countless tributaries join with the main river. 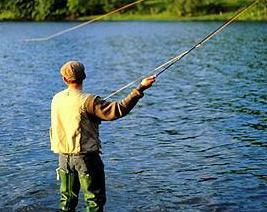 It is estimated that there are more than 130 miles of tributaries, which flow into the Moyola. needed to enhance their potential. Further downstream, and the predominant characteristic of the river is of long, slow, deep pools, which are well populated by native brown trout throughout the year. This stretch of river from Lisnamuck Bridge to Castledawson has many locally-known salmon holding pools, with fish appearing from mid-June onwards. As the river flows through the village of Castledawson, it returns once more to fast flowing water, with well-defined pools which are perfect for salmon and dollaghan. The river flows through the Moyola Estate, home of the former NI Prime Minister, Lord Moyola, now deceased. In the lower stretches of the Moyola, the water flow is much slower as it makes its way to Lough Neagh. There are however many defined pools in this part of the river, with pools such as the Thorn Hole and Stoneyford offering excellent angling opportunities.